Few years before despite whitewashes abroad, some mentioned that India can’t have a new captain because there is no better option. Now, we have a world leader Test and ODI captain who created a record even in ICC awards by being the first to win three major awards. 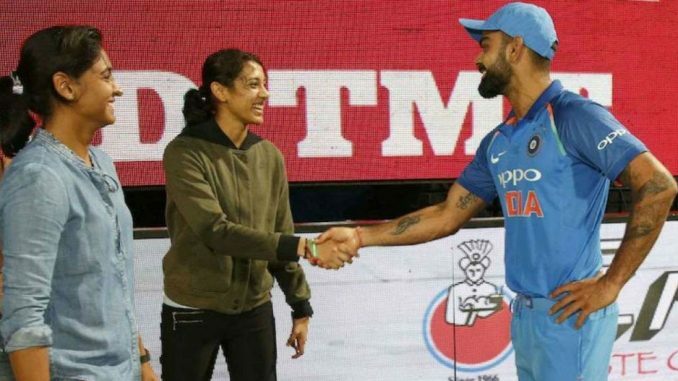 While Kohli created World Record with 5 rewards, Smriti Mandhana won big in Women’s category. Bumrah and Kohli has ruled the world in 2018 and not surprising that they are the only two common players selected in ICC Men’s Test and ODI Cricket teams of the Year 2018. Even in Wicket keeping choice, in his debut year Rishabh Pant has been selected in ICC test team. Harmanpreet Kaur was chosen as Captain of World T20I Team of 2018. Check complete list of ICC awards. While Indians maintain maximum presence in both teams, New Zealand and England follow them in different formats. Surprisingly less representation is from South Africa. Indians rule the Indians rule the ICC Awards for 2018 with multiple awards in other sections too. Congratulations to Indian Cricket fans as Indians rule the ICC Awards for 2018. India’s triumph in New Zealand to claim their fourth #U19CWC title was voted as the ICC Fans’ Moment of the Year 2018! It got 48% votes. 1st time: Kohli wins the Sir Garfield Sobers Trophy for ICC Men’s Cricketer of the Year 2018! 2nd consecutive time ODI Cricketer of the Year: He scored 1,202 ODI runs in 2018 at a stunning average of 133.55. He also became the fastest to reach the milestone of 10,000 runs in the format. Smriti Mandhana scored 669 runs in 12 ODIs with one century (135 vs South Africa) and 7 50s, averaging 66.90. Even in T20I World Cup, she finished as third top scorer of tournament with 178 runs. Jemimah Rodrigues and Radha Yadav of India finished second and third in voting. Voting academy: Javed Hamid Kakar, Emal Pasarly (Afghanistan); Lisa Sthalekar, Andrew Wu, Mike Hussey (Australia) Utpal Shuvro, M. Farid Ahmed, Athar Ali Khan (Bangladesh); Julian Guyer, Lawrence Booth, Nasser Hussain (England); Deep Dasgupta, Sunandan Lele, Jasvinder Sidhu (India); Ian Callendar, Barry Chambers (Ireland); Mark Geenty, Ian Smith (New Zealand); Peter Borren (Netherlands); Ramiz Raja, Abdul Mohi Shah, Mazhar Arshad, Bazid Khan (Pakistan); Shaun Pollock, Neil Manthorp, Firdose Moonda (South Africa); Saroj Pathirana, Russel Arnold, Rex Clementine (Sri Lanka); Peter Della Penna (USA), Ian Bishop, Barry Wilkinson, Vinode Mamchan (West Indies); Trisan Holme, Mehluli Sibanda, Mpumelelo Mbangwa (Zimbabwe).